Dining room tables bring families together. They are the boardroom tables of our homes where we joyfully discuss the ins and outs of our day while breaking for only short periods at a time to take another mouth full of mom’s top-notch cooking. We share, we laugh, we love…OK, maybe I’m overselling it a bit but I am sure we can all agree that dining room tables do indeed bring families together and even if they didn’t they still make a beautiful addition to any home. Where functionality meets style the result is wood, solid hardwood to be more precise, but adding “solid” and “hard” to the name is followed by adding another $300.00+ to the retail price. By adding DIY, however, we can slash a good amount off of the asking price. 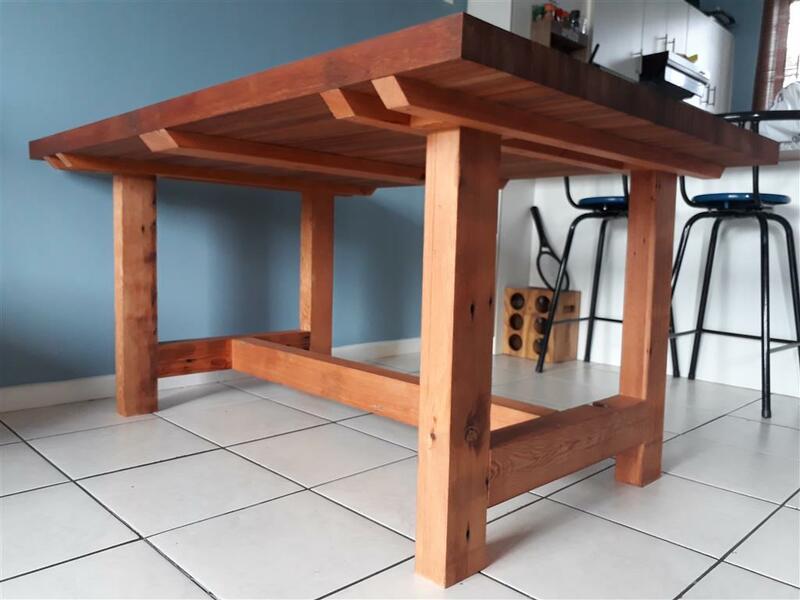 In this easy-to-follow tutorial, I will be making plans available for this beautiful solid hardwood farm style dining room table that can seat 6-8 people comfortably. 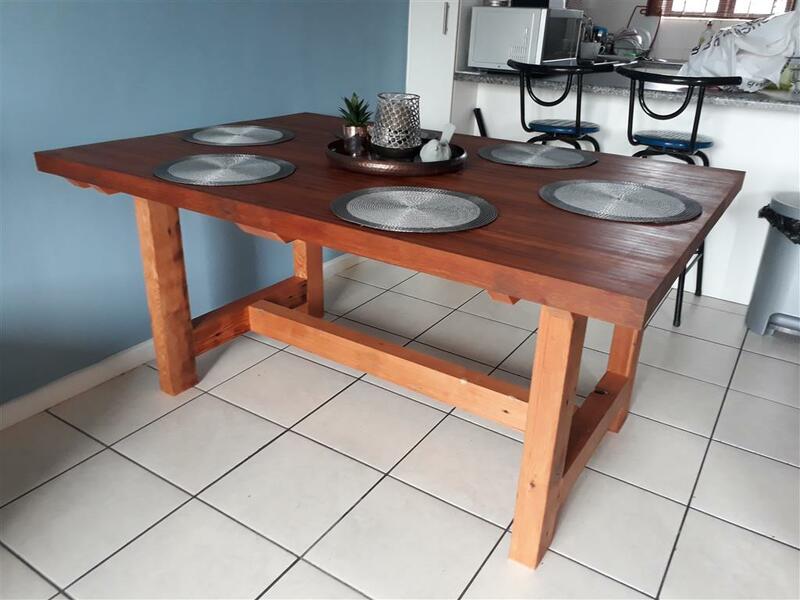 This table was built using lumber salvaged from old wooden doors but using processed lumber will yield similar results. 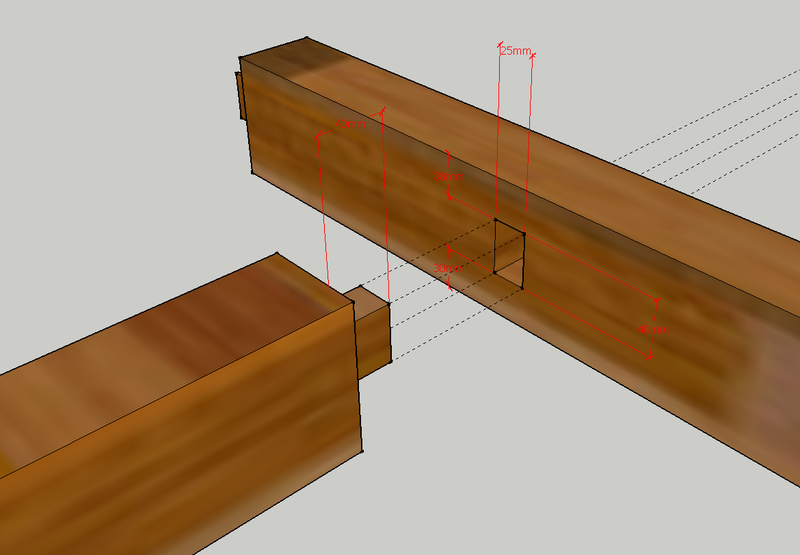 The base is assembled using mortise and tenon joints and is made up of components A, B, and C.
The joints are cut at a depth of 40mm, glued together and clamped to allow to cure. Fit temporary braces at the top of the base using clamps or screws to ensure that the base stays square while the glue is curing. The tabletop is made by laminating all (60) of the D components together. You can use wider planks for the table top to make the process less labored. i.e. 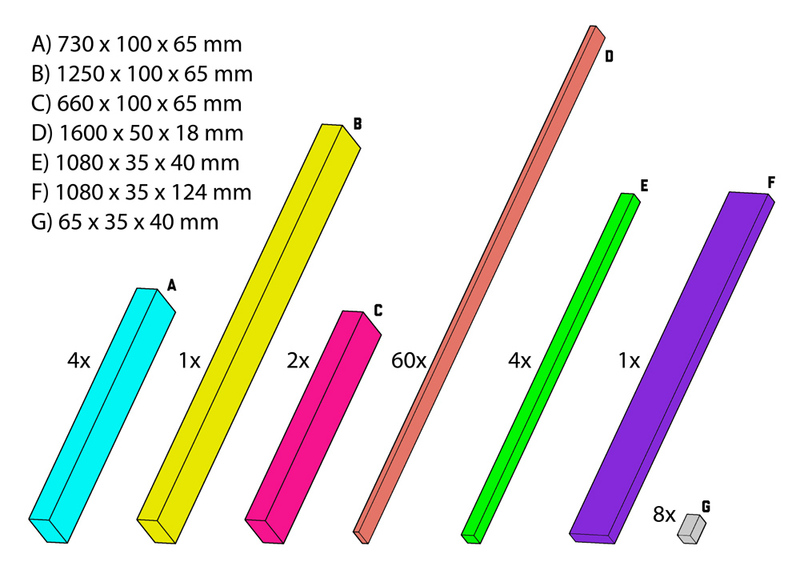 using 32mm (instead of 18mm wide) would mean you would only have to glue 30 planks together instead of 60 while using 64mm wide planks would result in only gluing 15 planks together. Allow the glue to cure and then, while the top is resting on a flat surface, sand down what will be the bottom of the tabletop using a belt sander. After the surface is sanded, fit the braces to reinforce the tabletop and turn around to sand down the top side. Use a circular saw to square out any unevenness that may have occurred at the edges due to the gluing process. To finish up the table fit the assembled tabletop to the base. If everything lines up correctly the top should just slip into place. Beautiful woodworking! I have the perfect spot at home to put one of these tables. Pretty sure with your free plans to build it I can make it happen. Thanks for the lay-out. I have a good friend who just retired and is moving to Texas. I passed this to him as well. He is much more of a woodworker than I am and I’m sure he will make this a project for himself. I’m very glad that you found value in this post. This was a fun project and delivered great results for me. I hope it does the same for you. Hey Jean, awesome article! 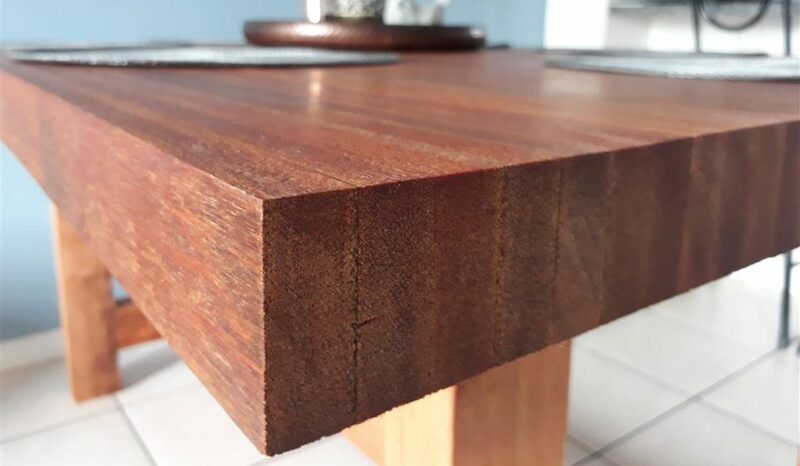 I’ve been working with wood for a few years now, and my wife’s been bugging me to rework our old table..with this article I might just make an entire new one for her instead! Personally, I very much enjoy restoring older furniture but making something new is also very rewarding. Best of luck with whichever one you decide to go with. Wow that was a great tutorial, such tables are very expensive in my country, and I really can resist getting such a table to my home, doing it myself makes me sure of a good quality used wood instead of hoping to be lucky in finding the perfect one, I’m looking forward to a tutorial about making wooden boxes that can be placed in the middle of the room topped with a runner and some candle holders. Great idea, I will definitely look into doing something along those lines. Be sure to stop by again soon. wow. the detail here is incredible. We own a a-frame wood house in florida, very rustic, and just spent way too much on a ‘farm table’ from a retailer. My older son would have really enjoyed this post and making us a kitchen table!! I will follow you so i don’t miss out on posts going forward. thanks so much. Great to have you here Hillary. Be sure to let us know what you think when we post new content. Love that table…will build one myself!!! Extremely brilliant the way you color coded the parts to show where they went. Hello Jean, what a great little table this turned out to be. I have a large family and would have to have a larger table. 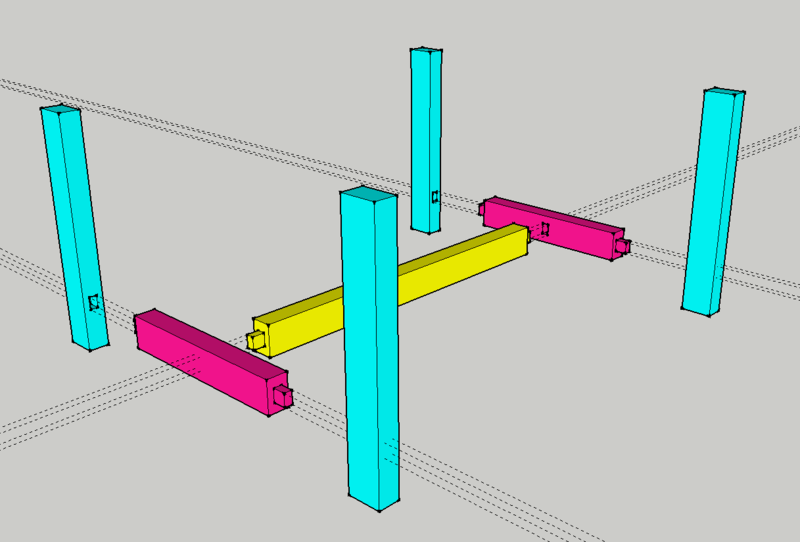 Would it be possible to have a table about 10 feet long doing it the same method you all used? Since you don’t have a double-sided electric planer large enough to plane both sides of the glued product, did you just simply sand it all? How long did that take? What wood would you recommend? Could I use long 2×4’s for the top? What if I ripped them in half to save weight, would that be strong enough for a top? Do you recommend placing screws in the wood along with the glue? Wow, thats a lot of questions. I like it. You would definitely be able to make the table longer with this design. You would be laminating the top in a way that the wood runs along the length of the table. Just remember to add the braces at the bottom of the tabletop. Yes, the table in the video was sanded. Starting with a 60 grit on the belt sander and ending on a 150. I used a straight edge across the table top to check for height deviations and correct it. after that, I finished the table with a 200 grit on the orbital sander. The sanding did actually not take that long. Altogether, I’d say about 2 hours. The would you use is entirely dependant on personal preference but personally, I am a big fan of darker hardwoods. 2×4’s should work great but ripping them in half would be a good idea. The table in the tutorial had a 1/2-2inch thick top and it was very heavy. Wood glue on such a surface should be more than good enough but I would still definitely suggest placing braces at the table top base. Great table & easy to follow plans. I have some wood in the garage that i didn’t have a use until today ! Looks like I have found my winter project ? Go out and build something. There’s few greater feelings. Hello Jean, great article. Solid content. The layout and presentation of your website looks great as well. The assembly part is really important here. It’s well described. 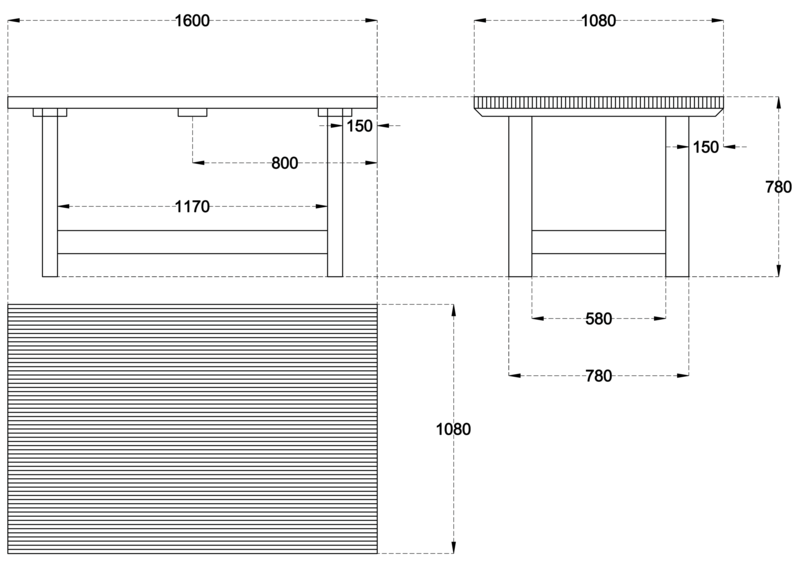 Being the DIY type of gal that I am, I started looking up some drawings and directions for making a coffee table. I am also in need of a kitchen table. I like this one! I had first started looking in the furniture stores, but man they are expensive and heck I am a single mom, I have better things to spend my money on, than pay a fortune for a table. This is simple, yet modern looking to me and something I am going to go ahead and make! I am curious how much you spent on the supplies for this table? Beleive it or not but this table didn’t cost me a sent apart from consumables. Don’t know if you got around to watching the video but the table was built from wood reclaimed from discarded garage doors. What a great post. As a collector of Teak furniture, I love the craftsmanship and dedication for someone who is a woodworker. Living here on Vancouver Island, there are many woodworkers here using reclaimed wood or fallen timbers. The work has always intrigued me, and this post displays the ease but complexity in creating beautiful works of wood. 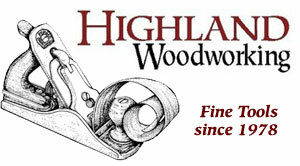 As a Handyman I feel utterly inferior, as a wood worker ? Forget about it. However, if I would ever try to be someone other than a computer guy, your “How to” instructional is awesome – easy to understand and straight forward. I’m sure my girlfriend would appreciate the effort. And it makes you feel accomplished – I like that ! Thanks for the idea, Jean ! Thanks for stopping by Rico. Best of luck if you ever do decide to build something. As you say, it makes you feel accomplished. Hey Jean, nice to find another post of yours online. Thanks for the detailed table plans. It surely is a very nice furniture piece. I’d love to make one myself, but I have two constraints. One is time and the other is work-space. My single garage at home is pretty much occupied as storage space and believe me, all my tools are in there as well. I have subscribed to your newsletter. I know exactly what you mean. I am also limited in space. If I had my way I would turn my entire property into a workspace and just keep a space to eat, sleep, and brush my teeth. Unfortunately, the misses won’t have any of that nonsense so I’m also stuck with my little old single garage. Hope you find some space to enjoy the beauty that is woodworking. New to the website, love it so far. Just wish the dims were Merican! All my tapes have whole numbers with sixteen black marks between them. Btw…what’s the deal with the black diamond? 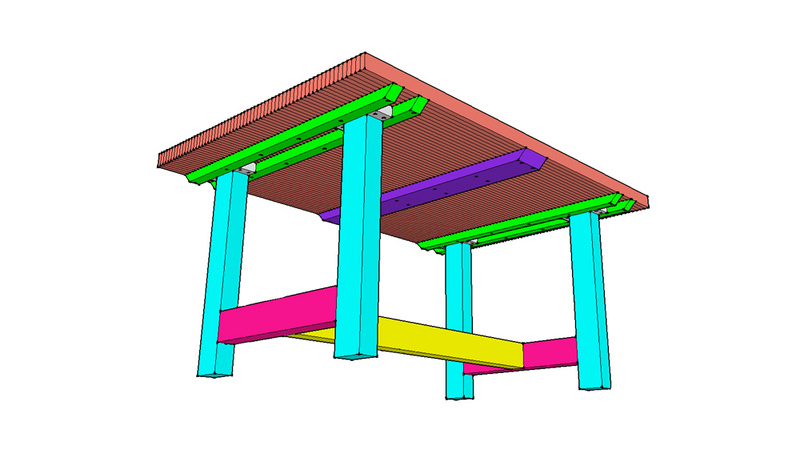 I’m guessing truss spacing. I did, in the beginning, add both Metric and Imperial units on all the diagrams. I would be sure to consider adding both on future builds. I’m afraid I don’t know what you are referring to with regards to “black diamond”. Could you maybe be a bit more specific? Sadly, I don’t think I have the plans anymore but I’ll take a look.  Some of the links on this website are affiliate links, which means that I may earn a commission if you click on the link or make a purchase using the link. When you make a purchase, the price you pay will be the same whether you use the affiliate link or go directly to the vendor’s website using a non-affiliate link. 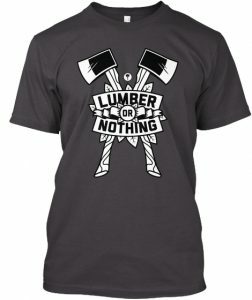 By using the affiliate links, you are helping support the Woodworkjunkie.com website, and I genuinely appreciate your support. Woodworkjunkie.com is a participant in the Amazon Services LLC Associates Program, an affiliate advertising program designed to provide a means for us to earn fees by linking to Amazon.com and affiliated sites. Rufus, the Woodwork Junkie mascot reminding you SAFETY comes FIRST! Power tools can be dangerous if not used correctly. ALWAYS use your power tools and equipment strictly as instructed by the manufacturer! Don't be a dummy - Work safe and stay safe. All material on this website is provided for general information purposes only and does not constitute medical, legal, financial, or other professional advice on any subject matter. The contents of this site depict my opinions, working habits, and methods and by no means do I suggest it is the correct way. Should you choose to make or mimic anything you see on this site you do so entirely at your own risk. Your safety is your responsibility! Therefore I accept no responsibility or liability for any injuries or accidents you may have while attempting anything depicted on this site.